We got Facebook! We got Twitter! And we got The Lost World Of Sid & Marty Krofft! My relationship to Guardians Of The Galaxy has followed a surprising arc; two years ago I was barely aware of this weird agglomeration of third-tier Marvel characters. I began to come around the more I saw of it, and now that it’s out, I’m firmly convinced that this movie was made for me. I am Groot, you might say. Okay, if that was entirely true there’d be at least one Monkees song on Peter Quill’s Awesome Mix (maybe on Volume 2? ), but far-flung space adventures about a ragtag group of misfits who save the universe stimulate my equivalent of Mowrer’s Van Helsing Cortex; call it my Atari Force Cortex. Having this particular fixation means being the one person who saw Starchaser: The Legend Of Orin in the theater, in 3D. I’ve seen Battle Beyond The Stars, but not Seven Samurai or The Magnificent Seven. So it moves me to figurative tears to get a movie like Guardians, made with care, skill, and a budget. And that’s before you get to that final scene. …but really, I’ve been keeping that torch lit for twenty-eight years. Dig the scene: you’re an eight year old boy in the late 70s, which means you’re obsessed with Star Wars. Your mom is in the habit of bringing you back a comic book when she goes grocery shopping. Mom sees this comic on the spinner rack, it’s doing a Star Wars parody. It stars a duck, so it must be funny kartoons for kids, right? So you, this eight year old obsessed with Star Wars, read what’s supposed to be a fun Star Wars parody (not unlike the one Marvel themselves did in the pages of Spidey Super Stories just a few months before), and are exposed to this deeply weird, slightly creepy tale of Dearth Vapors, a villain called Bzzk’Jho, and a planet called Boorbanq ruled by a lounge-lizard Mayor McCheese. After Monty Python (first encountered at age 6) and The Beatles (first encountered via a TV showing of Yellow Submarine at age 4), and just before Douglas Adams (age 10), it was one of the early influences that shaped me into the sane, well-adjusted individual I am today. Seriously, check out that first series, written by Steve Gerber. The whole thing is a weird, satirical, stream-of-consciousness masterpiece, with humor ranging from social commentary to labored, painful puns. While the fatsuited Barney Miller in the above strip was a hypothetical, Howard The Duck is a perfect case study for a failed adaptation being mistaken for a failure of its source material. I finally brought myself to watch it again, and while it would have made a perfect double feature with, say, My Science Project, circa 1987, it had no goosedown business trying to pass itself off as an adaptation of Howard The Duck. I know a new take on Howard isn’t in Marvel’s immediate plans. And yet, the fact that the non-Avengers pillars of their universe – the Fantastic Four, the X-Men, Spider-Man – are at other studios, Marvel and Disney need to keep giving their c-list characters their turn at bat. That’s how we got Guardians Of The Galaxy, and look how that turned out. So let’s start laying some groundwork. I previously suggested Edgar Wright or the Duplass Brothers to direct, with Paul Giamatti as Howard’s voice. Lately I’ve been into the idea of Dan Harmon, both as director and star. The point is, we need to get this ball rolling, so that when Marvel needs to get a lower-budget movie going, or is looking for more direct-to-Netflix material (Howard could join The Defenders! ), the groundwork will have been laid. So who’s with me? Tweet #HarmonForHoward! Mowrer, you’re in, right? Spoiler alert, dude. Not everyone has seen the movie. If we spoiled the surprise for you, then I’m genuinely sorry. Marvel has been creating genre films under the umbrella of comic books. 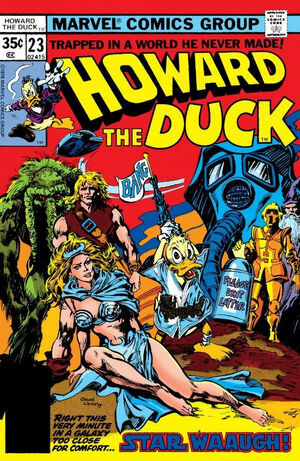 Captain America is a political action thriller, Guardians is cosmic sci fi comedy, etc… Why not use Howard the Duck to create a low-brow PG13 comedy? Hand it over to some comedy team like Seth Rogen & Evan Goldberg, Judd Apatow or Kevin Smith. Budget could be significantly lower than other Marvel projects and if it was released in theaters (as opposed to Netflix) it would still probably bring in 90million opening weekend! Yes! It’s at the fringes of this off-kilter universe where gods are aliens and spies deal with aliens. It’s a weird world, one where Howard is NOT the craziest thing. Someone used a Cosmic Cube somewhere, and a hapless duck wakes up one morning to find himself surrounded by hairless apes. How do you keep your sanity? Sarcasm and your friends. Y’know…since I recently started listening to Harmontown, I can totally see it Richmond. Count me in. #HarmonForHoward indeed! Ah, excellent choice. Whether you’re a Community fan or never heard of the guy, Harmontown is hilarious.